With the news about blockchain startup Blockstreams launching their Liquid Network earlier in October, sidechains are a hot topic once again. The new technology is expected to bring much-needed innovation to the blockchain field, enhance the scalability of existing blockchains, and have an overall positive effect on the cryptocurrency market. What are sidechains after all? 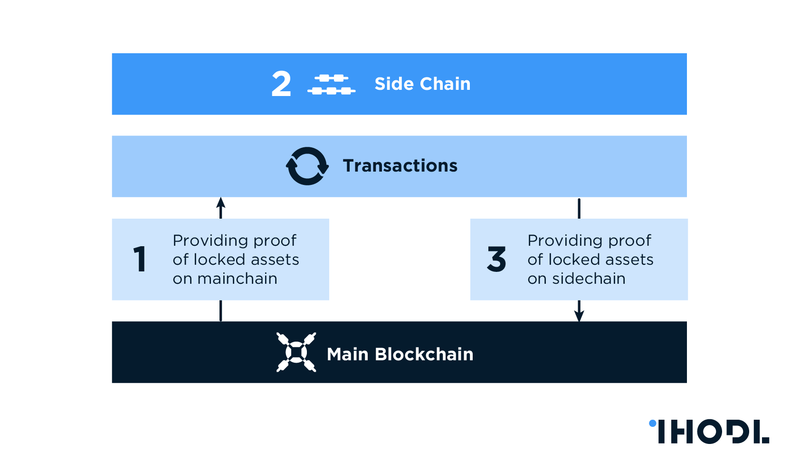 In other words, sidechains are extensions connected to the main blockchain by means of a two-way peg, which enable validation of data from other blockchains. The digital assets from one blockchain can be used in a separate blockchain and then transferred back to the original blockchain if necessary. The idea of sidechains comes back to the notion from 2014, brought up in an academic paper titled “Enabling Blockchain Innovations with Pegged Sidechains”, that was published by several prominent figures in cryptography and cryptocurrency industry who, in fact, later founded Blockstream. Trade-offs between security and cost as well as decentralization and scalability. Trade-offs in certain blockchain features (i.e., bitcoin’s scripting language). Assets like smart contracts, real estate, derivatives, bonds, stocks that can also be traded on blockchains. Risk of monoculture in bitcoin (i.e., if any of bitcoin’s many cryptographic components fail, it could result in a total loss of value). Potential of new features with advancing technology not originally foreseen during bitcoin’s creation (i.e., improving privacy and censorship-resistance could be with the help of ring signatures or cryptographic accumulators). Broad consensus is required to upgrade bitcoin, resulting in slow and cautious processes. They are as we already mentioned — attached to the main blockchain with a two-way peg, a sidechain allows for interchangeability of assets between the main blockchain and the sidechain at a rate that’s been predetermined. To make a sidechain transaction a user first needs to send their coins to an output address, where they get locked — this guarantees that these coins won’t be spent anywhere else. When the transaction has been completed, a confirmation comes across the chains ensued by a waiting period. Once the waiting period is over, the equivalent number of coins is released on the sidechain, meaning the user can now access and spend them. One can always put coins back on the parent chain with a reverse transaction. The are federated groups, members of which can be chosen by sidechain creators, that decide when to lock and release the coins a user makes a transaction with. While this model allows for better privacy and faster speeds, it also creates an additional layer between the main chain and the sidechain, and as some say, this may impede bitcoin adoption. What can sidechains do for traditional blockchains? Sidechains are designed to address one of the main issues of traditional blockchains — limited transaction speeds. Unlike traditional blockchains, sidechains enable breaking a chain into multiple blockchains without having to wait for all nodes on the network to agree on the block before adding it to the chain. By dramatically improving the transaction speed, sidechains give extra functionality and greater scalability to existing blockchains. “One of the complaints about the blockchain technology is how long a transaction takes to complete and to get a confirmation, especially at times when the network is busier. A sidechain can alleviate that issue, processing the transaction almost instantly and reconciling with the main blockchain later,” Henry Stanley, CEO of ICOAxiom.com, said to ihodl.com, adding that in doing so it greatly speeds up blockchain technology and opens the door to much more real-time uses. Matt Godshall, editor-in-chief of Unhashed, believes that sidechains have а “tremendous potential to fundamentally disrupt the blockchain/cryptocurrency industry,” stating that while EOS is “the current king of transaction speed, due largely to their Delegated Proof of Stake (DPoS) consensus algorithm,” sidechain platforms “could give EOS a run for its money.”According to Godshall, sidechains may be particularly important for ethereum, that suffered “a particularly steep crash” in 2018. “If Ethereum can successfully incorporate sharding (Ethereum's name for sidechains) into the platform, it could drastically increase the network's performance and solidify its position as the number one DApps platform on the market,” Godshall said. Hailing from San-Francisco, Blockstream Corp. launched its Liquid Network, a solution for scaling the bitcoin network, earlier this week. Since 2015 Blockstream had been developing technology which would enable fast and secure transactions. “Sidechains like Liquid will disrupt the industry by showing that you can drive real innovation by anchoring to Bitcoin rather than creating a standalone new blockchain,” the company press service said. With a global ambition to allow for smart contract capabilities and faster transactions on the bitcoin blockchain, Rootstock (or RSK ) has developed an open source testnet Ginger for its sidechains. The testnet has a two-way peg with the bitcoin blockchain, therefore, bitcoin miners can earn a reward through merged mining. That being said, sidechains bear much promise for the crypto industry. Allowing for better blockchain scalability, while at the same time sidechains can significantly speed up developing and marketing of new solutions on the blockchain.